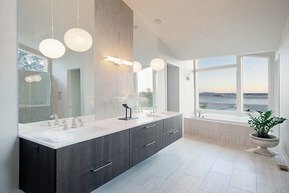 Bathrooms are among the most used rooms in a house and the second most remodeled, garnering a nice return on your investment should you decide later to sell your home. Some choose a bathroom renovation to take advantage of wasted space, optimize the layout, or update the style. At Cabinet Genies, we offer more than just cabinetry. We also provide bathroom remodeling services, and we are ready to help you get started with your remodeling project. A minor bath remodel may involve replacing outdated fixtures, refacing the vanities, and replacing the sink. Or, perhaps you have an entirely new bathroom design in mind with a revised floor layout, room expansion with walk-in closet, and unique luxury features. Before the project begins, our professionals will discuss your needs, expectations, and goals and provide bathroom remodel ideas you may not have thought were possible or had not thought of at all. This initial planning step is perhaps the most important in any home improvement venture because it sets the foundation for the entire project, providing a guideline for timing, scope, and budget. Young couples embarking on a bathroom remodel often seek a space for a growing family while meeting the children’s needs. A child’s bathroom design may require adding a bathtub or reconfiguring a space to design a Jack and Jill layout between two bedrooms. Age or injury may require a bathroom remodel suited for those with special needs. Older adults may need the ease and assistance offered by features like walk-in bathtubs and safety rails, while a zero-depth floor entry bath allows disabled individuals to more easily enter the space with aid. Other handicap accessible updates include lowering the bathroom sink and vanity, widening the space for easier turn radius, and replacing bathroom fixtures with a handle style that is easier to grasp and turn. Some bathroom remodels are necessitated by problem and tragedy like fires, water damage, or age. Older homes may have outdated wiring that poses danger and risk of a fire hazard. Bathrooms are wet, humid spaces, and over time, water and moisture can seep through worn grout or caulking and cause mold or mildew in the walls. Improperly installed showers may lead to wall or floor damage. Part of the remodel process involves assessing the situation and solving the issues. Wallboard must be appropriate for a moist, humid area, and a moisture barrier is necessary in shower spaces. Vent fans and waterproof paint should also be used in bathroom spaces. For some, a dream master bath is a place to unwind and relax in a spa-like getaway. For this reason, master bathroom remodels often involve room expansions and more sophisticated design elements. While walls are often removed, sometimes they are added to separate the toilet area from the rest of the bathroom space for added privacy. The shower may be enlarged with updated features like glass tile walls, multiple water jets, or rain heads. Large, soaking bathtubs, beautiful claw-foot bathtubs, or steam rooms may be added, and some may choose to optimize the functionality of the space with a new laundry closet, beverage area, or sitting niche. Other common updates to master bathrooms include dual sinks, heated floors, and added bathroom storage. Lighting is an often overlooked area, but one that is important and can provide a lot of style for little effort. Proper lighting can make a small bathroom appear more spacious. A tub area can be glammed up with the addition of a mini chandelier hung over the bathtub or the installation of dimmer lights can provide a tranquil feeling. Instead of a traditional night light, adding lighting to the toe kick area under cabinets provides a lighted path. Many people have just one light fixture over the mirror, but this can add a vanity shadow and make your image in the mirror appear to have darker under eye circles and dark face shadows. Consider replacing the over-mirror light with two sconces placed on either side of the mirror for cross-illumination. When it comes to a bathroom remodeling project, the sky is the limit. From simple to ornate and everything in between, Cabinet Genies has the skill and knowledge to create your dream room. When it comes to most bathrooms there’s a lot going on in a relatively small space. It’s essential to create a design that’s both functional and stylish within the space. At Cabinet Genies, you get a lot of Bathroom Remodeling options today in Bathroom Cabinets. They each provide the much-needed storage in high traffic and often cramped spaces. Taking the time to plan a Bathroom Design helps to make better use of the entire space. Cabinets for bathrooms range from standalone pieces to bathroom vanities. The cabinets include a sink with drawers and the underneath compartments. 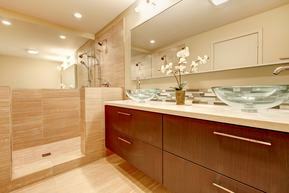 Bathroom Remodeling is contingent on the size and configuration of the existing space. Our Design Services can provide a design that can incorporate the cabinet storage to fit the room’s usage. If the bathroom has two users in a small space the goal is to divide the space proportionately. It allows both users to store and access their items easily. If, you’re remodeling your bathroom and adding more space both vanity cabinets and standalone cabinets work. Standalone cabinets or islands are useful for storing towels and linens. In some cases they add extra storage for supplies like soap and shampoo. They also work to store appliances like hair dryers to electric razors. Something to keep in mind, bathroom remodeling should last for several years. As trends change, the room can be updated with new paint, a shower curtain and other Bathroom Accessories. At Cabinet Genies, our in-house design team, can help you to create your dream bathroom that is stylish and practical. Working with our Bathroom Designer creates a bathroom that grows with you and adapts to the changing trends.